Alfredo sauce is a rich and creamy white sauce made with garlic, butter, heavy cream, and parmesan. This savory cheesy sauce infuses garlic into the butter and can be used with all kinds of pasta or even on top of vegetables. This recipe is different, I dare say better, than an alfredo sauce recipe with cream cheese. Homemade Alfredo Sauce is pure heaven. Correction. This alfredo sauce recipe is pure heaven. I’ve had plenty of alfredo sauces, both in restaurants and those pre-made at the grocery store, that were borderline gross. You may also be a fan of alfredo sauce made with cream cheese. 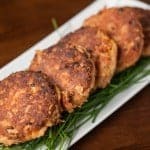 This recipe really stands out to me because of the incredible flavor. Use this sauce to smother homemade pasta. It’s my kids’ favorite. In fact, they demand request that it be made for their birthday dinners. Throw some cajun chicken on top and you have an outstanding meal. What about smothering your favorite veggies, like roasted root vegetables or sauteed asparagus, with some of this warm cheese sauce. YUM! If you’re asking this question, my friend, you’re missing out on the finest things in life! Alfredo sauce is a traditional Italian sauce made with Parmesan cheese and butter. When tossed with hot pasta, the cheese melts and emulsifies the liquid to form a smooth, creamy, rich sauce. You’ll find a ton of different recipes out there, but in general, it’s a very easy sauce to make. I discovered the trick. All good alfredo sauces have garlic. But, raw garlic is very strong. It’s also very easy to burn garlic if the temperature is too high. Burnt garlic tastes bitter. The trick for the best tasting alfredo sauce? Infuse the garlic in the butter. My recipe starts by cooking minced garlic with butter over a very low heat. The higher quality garlic and butter you use, the better your sauce will be. By cooking the garlic and butter over a very low temperature, you’re able to extract all of that wonderful flavor from the garlic without it burning. That intense flavor carries through all the way to the finished sauce. The infused garlic will turn a beautiful golden brown and will give your finished alfredo sauce a gorgeous color as well. 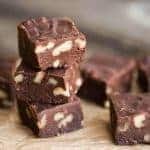 My recipe is quick and easy and involves just a few steps. This recipe is made in a pan. I highly recommend All-Clad cookware, but any pan will due. Cook the garlic in the butter over very low heat. I think garlic minced through a garlic press is a million times better than chopped garlic. When garlic is pressed, you expose the maximum amount of surface area. That means you’ll get the most flavor out of it. Next you’ll add heavy cream. Not all of it. I reserve some for step three. You want this cream to come to a gentle simmer in the garlic butter. Mercy. 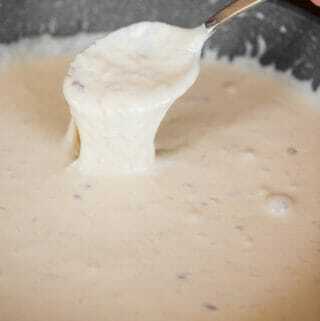 To finish the alfredo sauce, you’ll remove it from the heat add the parmesan and some additional heavy cream. You can certainly buy shredded parmesan, but if you use a microplane grater, the parmesan will melt instantly. Will alfredo sauce thicken as it cools? Yes. Although homemade alfredo sauce is easy to make, it can be rather finicky. If it cools too much, it will get too thick. If it gets too hot, it will separate. The trick is to keep it just warm enough. In that respect, it is actually quite similar to a hollandaise sauce. 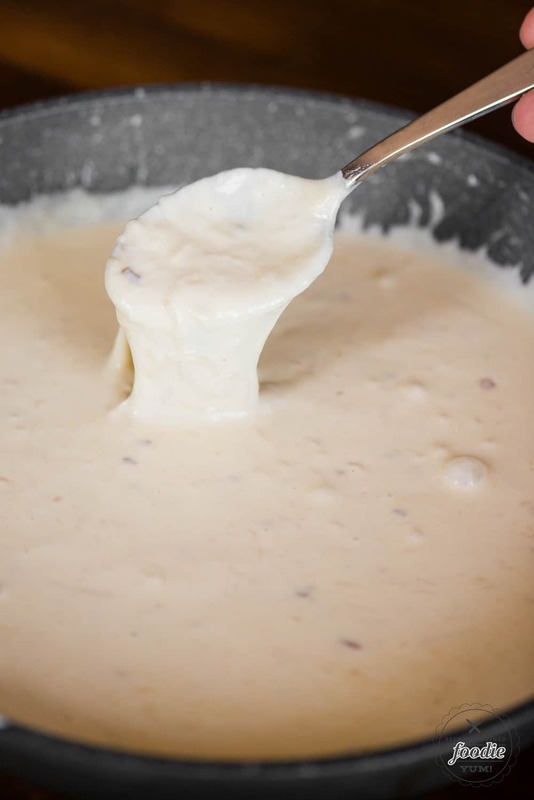 If your alfredo sauce is too thick because it is too cool, the remedy is to heat it up gently. This can be as easy as adding super hot, freshly drained pasta to your sauce. Can alfredo sauce be frozen? Yes it can. Although I think it is much better fresh, it is possible to freeze the sauce. If you want to make alfredo sauce in bulk, or prepare it ahead of time, you can freeze it in an air tight container. Just be sure to allow the alfredo sauce to fully thaw before you attempt to reheat it. Then, remember the low and slow method. Taking the temperature up too hot and too fast will cause your alfredo sauce to separate. How much alfredo sauce for one pound of pasta? Tomato based sauces usually require, in my opinion, about 24 ounces per pound of pasta. That’s why a jar of pasta sauce goes great with a pack of pasta. For oil or cream based sauces, you don’t need that much. As little as one cup of alfredo sauce will cover a pound of pasta. I, however, would rather have a little too much sauce than not enough. This alfredo sauce recipe makes more than enough for one pound of pasta. If you’re not sure how much one pound of pasta is, that’s generally how much is in one pack. Can you make alfredo sauce with milk or half and half? This one is tricky for me to answer because I’m a firm believer that alfredo sauce, or any cream based sauce, should be made with heavy cream. Milk or half and half just don’t have enough fat to thicken a sauce to my liking. You could always add more parmesan to get the added fat, but then you’d end up with a thick ball of melted cheese. 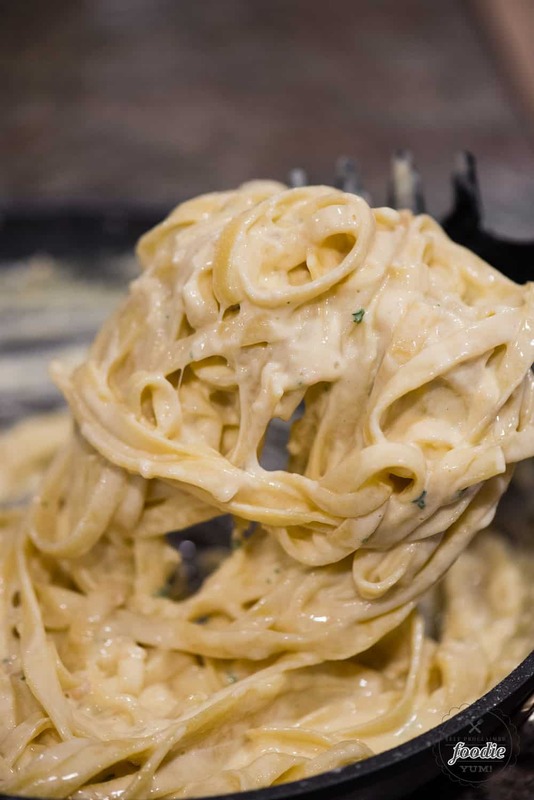 If you’re absolutely craving homemade alfredo sauce and can’t get your hands on heavy whipping cream, you can use milk or half and half as a substitute but you will need to add cream cheese or mascarpone to thicken it. Take my advice: buy heavy cream by the half gallon at Costco. That way you’ll never run out and will be forced to make all sorts of lovely recipes like my mascarpone frosting or homemade ice cream to use it up before it goes bad! Alfredo sauce is a rich and creamy white sauce made with garlic, butter, heavy cream, and parmesan. This savory cheesy sauce infuses garlic into the butter and can be used with all kinds of pasta or even on top of vegetables. This recipe is different, I dare say better, than an alfredo sauce recipe with cream cheese. Add butter and garlic to a saute pan and heat over low heat. Allow to cook until the butter is infused with the garlic, about 5 minutes. Add 1 cup of heavy cream, stir, and allow to come to a simmer. Increase heat to medium, if needed. Cook for 5 minutes, stirring occasionally. Remove from heat and immediately add in parmesan cheese and remaining heavy cream. (Note: the parmesan will easily melt if it was finely grated from a block. If you used pre-grated cheese that is thicker, you may have to continue heating over low heat to get it to melt.) Stir to combine. It will take several minutes for the cheese to melt. It will look goopy at first and then the sauce will be creamy and smooth. If sauce needs to be thinned, add additional heavy cream. To serve, toss with tossed pasta or use to cover vegetables. Alfredo sauce does not heat well in microwave. If reheating alfredo sauce on it's own, allow for it to come to room temperature and then add hot pasta or vegetables to the sauce. That should warm it enough. If necessary, you can reheat in the microwave on low power. Do not over heat. Disappointed in this sauce. After I added the hot pasta, the liquid in the sauce seemed to be absorbed by the pasta and I was left with basically “dry” fettuccini. I had already plated it when I realized this and it was too late to add more cream. Taste was ok though. Hi Elizabeth, So sorry to hear that! Is it possible you used too much pasta and it wasn’t the sauce? I ask because I’ve done that before. 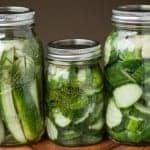 I think this recipe will work with about a pound of pasta, however I highly recommend grabbing at least a cup or so of the salted pasta water before you drain it. Once you add the pasta, add some of the water if it appears to thick. It won’t change the flavor. 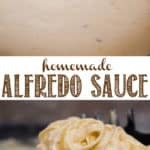 This is the best alfredo sauce recipe I’ve tried. So much flavor!!! Such an easy recipe. So glad it doesn’t call for cream cheese. I love cream cheese… but not in my alfredo sauce! Hi Monica, Totally understand. And yes – too much pasta will just absorb the sauce. I think this recipe will work with about a pound of pasta, however I highly recommend grabbing at least a cup or so of the salted pasta water before you drain it. Once you add the pasta, add some of the water if it appears to thick. It won’t change the flavor. This sauce is amazing! I am very picky about my Alfredo sauce and infusing the garlic in the butter makes all the difference in this recipe. My family requests that I make this multiple times a month! We do 1 lb of penne pasta with the sauce. It could probably use a little extra sauce, I’ve never tried adding the saved pasta water so I’ll do that next time. If you desire to make it with milk or half and half, simply sprinkle a Tbsp of Wondra flour into the garlic simmering in the butter. 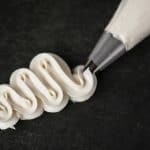 Whisk until the flour bubbles. Then stir in the milk (or half and half), Parmesan, and adjust the thickness accordingly with either more milk, or pasta cooking water. It’s not as rich, but your arteries will thank you. But of course, pasta with cream sauce is not the same as pasta al Fredo, which is just butter and parmesan. What’s the serving size ? Hi Dayna, The alfredo sauce makes about 3 cups and I said that there were about 12 servings in the recipe which would put the serving size at about 1/4 each. I realize that is on the smallish side if you’re planning on making fettucine alfredo, but I wanted to give a smaller option in case someone was making the alfredo sauce to top veggies as a side dish instead. Hope that helps! Glad you liked it! It’s a favorite in our house. Im confused on how your Alfredo sauce has only 186 calories where as other recipes have 380 calories up to 670 calories. How is it yours made with the same exact stuff as there’s and yours has fewer calories than the others ? Hi Wendy, I consider a serving size only about 1/4 cup. If you drown your pasta in alfredo sauce, you’ll be getting a ton more calories! Great sauce! It’s a lot though! Can the rest be frozen? Hi Heather, I would think it could be frozen, but I’ve never tried. We always eat the entire batch and the kids are mad I didn’t make more!